Ahhh... just look at those donuts. Take a moment to imagine the smell. The taste. Is your mouth watering yet? Temple, located at Burley Place on the outskirts of Leeds city centre, tucked behind a petrol station and between a couple of auto repair shops, is a donut and coffee shop adorned with potted plants, neon signs, a vintage photobooth and an extensive menu of elaborate plant based drinks infused with superfood powders and Northern Bloc icecream. 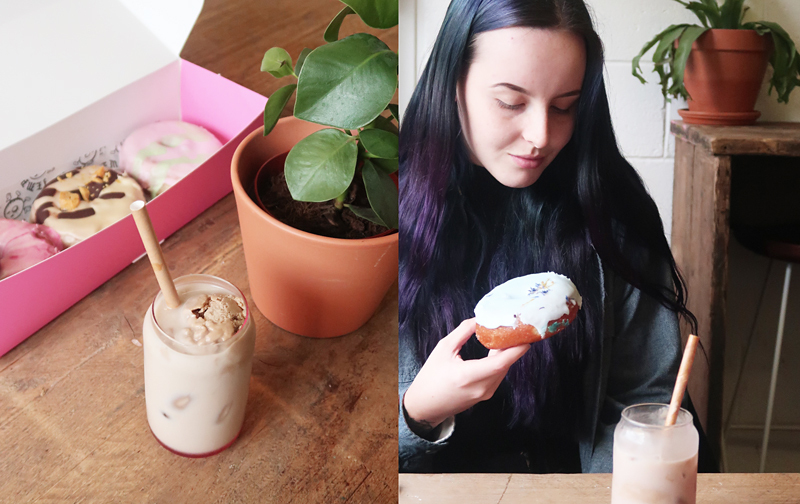 Some more 'traditional' flavours - if trendy vegan cafes are commonplace to you - include golden mylk, a health junkie special, and Temple's answer to a charcoal latte, the black sabbath. 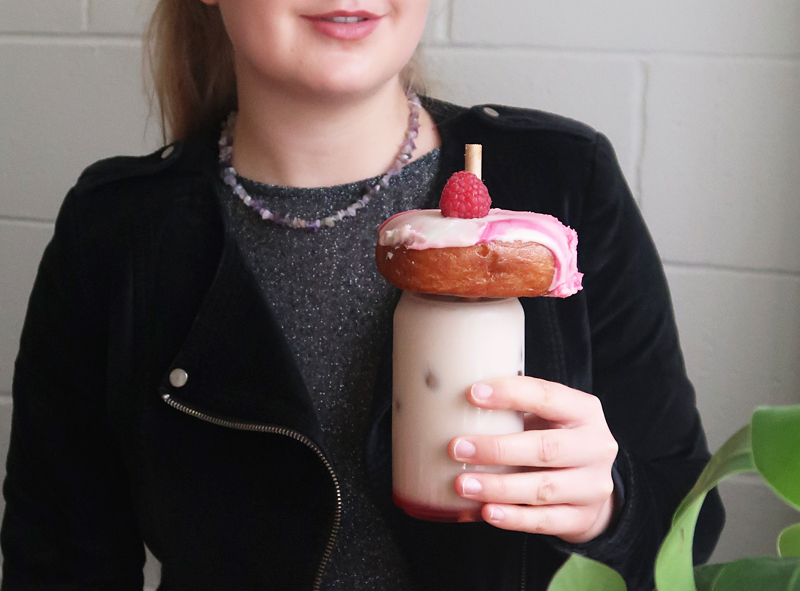 Faye and I both opted for an iced latte (to honour the season of Spring that we are allegedly experiencing) a combination of oat milk, hazelnut and rose ice-cream, and rose syrup. They also had a spirulina based concoction called blue oyster cult, and a combination of strawberry and yuzu ice-cream, oat milk and matcha green tea powder. 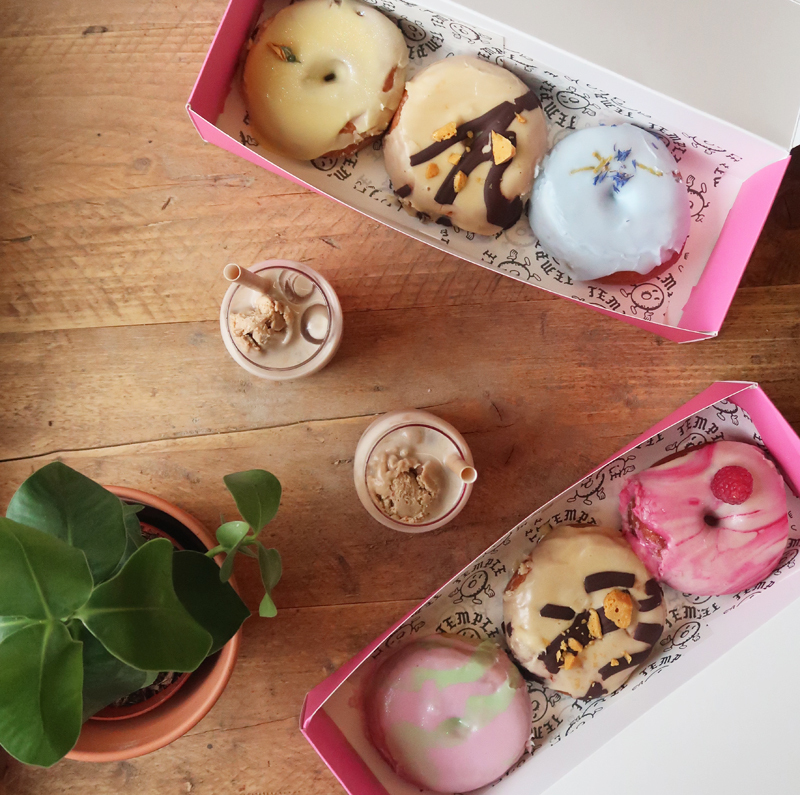 We both selected three donuts each, primarily to get one of those fabulous pink boxes, but also to be money savvy because you save 50p when you buy a box of three... perfect justification, right? I picked raspberry, caramel and cinder toffee, and rhubarb and custard. After a bite or two (or half) of each donut, I can confirm they all tasted as incredible as they looked. We left with full stomachs and happy hearts, and I've been daydreaming ever since of my next visit, when I may or may not purchase a box of six... for research purposes, obviously. 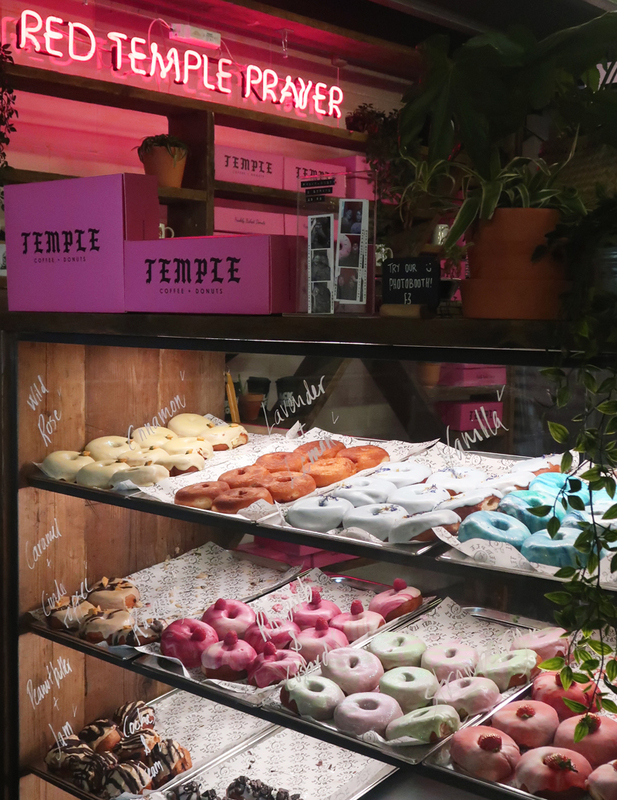 If you have a sweet tooth, and enjoy culinary social spaces that are cool without trying to be, I suggest you head to Temple asap. These look absolutely delicious - if I'm ever in Yorkshire I'm definitely going to check this out!